In "Caribou Rainforest," Moskowitz doesn’t spare us a vivid look into the animals' struggle, as the caribou, muzzles dusted with snow, eke out their survival day to day. The brave and beautiful book “Caribou Rainforest: From Heartbreak to Hope” reveals a remote inland Northwest rain forest few even know exist, and the searing plight of an animal virtually no one has ever seen. 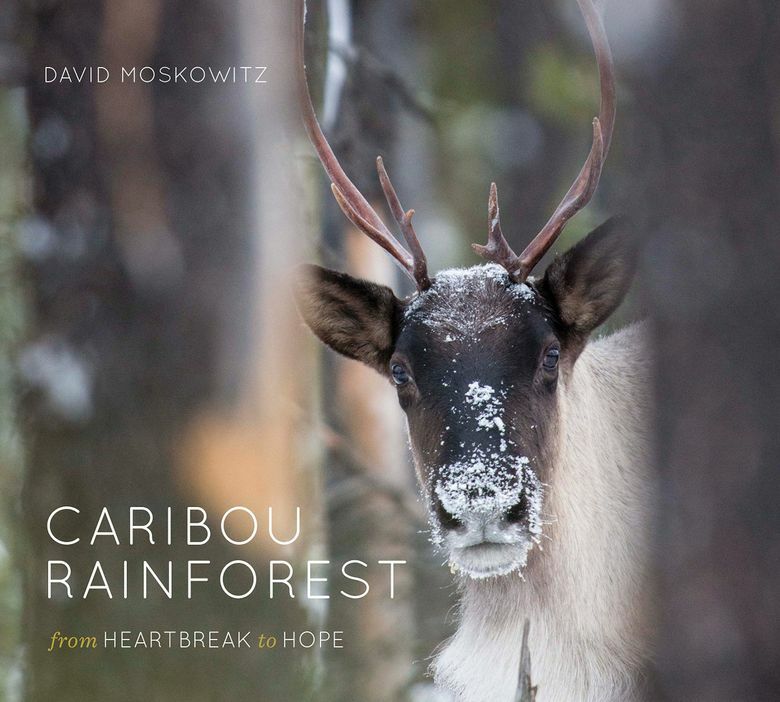 Author David Moskowitz traveled to the land of the mountain caribou, to document its struggle for survival in the inland rain forests of Washington, Idaho, Montana and British Columbia. There he documents a story of our times, in the mountain caribou’s last stand in a fast vanishing habitat. This is no natural disaster. As loggers have cut and cleared the forests the caribou need to survive, the last mountain caribou in Washington are being pushed out of their primordial habitat. Biologists captured most of the last of the remaining Washington herd this winter, to put them into a pen for captive breeding. More mountain caribou remain wild on the B.C. side of the border, but there, too, the caribou’s fate rests in the hands of humans, and our capacity for restraint. Unique in the world for its distance from the sea, the temperate inland rain forest 300 miles from the Pacific that is home to the mountain caribou is under siege. Moskowitz chronicles its destruction, from tree to toilet paper. Moskowitz does not shy away from the conflict, capturing with his camera loggers busily felling old growth. He tells in detail the story of failed land management that has brought the caribou to this sorry state. Here, too, is his wonder at an animal so elusive that many of the spectacular photos in the full-color book were taken by motion-activated cameras triggered by the animals themselves. These photos of the caribou going about their daily life are deeply affecting. The fragility of their lives is stark against the vast and rugged landscape that is their home. They ask for so little — shreds of lichen they forage from old-growth trees are their sustenance. The beseeching, big-eyed expression of these animals is haunting, and Moskowitz doesn’t spare us a vivid look into their struggle, as the caribou, muzzles dusted with snow, eke out their survival day to day. They are adapted, he writes, like no other large mammal to survive in the high mountains in winter, feeding on tree lichens they reach on ladders of deep snow. They are, as he so beautifully puts it, one rarity nested within another, specialists in a distinctive landscape like nowhere else. A tiny calf with just nubbins of antlers is a look into the future — if it and other offspring can manage to hang on. That they do so is all the more remarkable in the craggy, harsh landscape that has always been their home. Moskowitz states clearly how our own comfort creates their distress. He does not turn away from the conflict even in his own relationship with nature, when, on the trail of the caribou, exhausted and bruised, he and a climbing partner emerge from a slog through slide alder into a clear-cut and feel, more than anything, relieved. It is this honesty that keeps the book and Moskowitz taut in observation and essential in message. What Moskowitz documents is a need for a fundamental shift in our thinking, to see not just animals but the weave of relationships between animals and their place, and ultimately, ourselves. We must attend to the processes that created it all, Moskowitz writes, for nature is not just a basket of things, some we like and keep, and others we don’t care about and discard. Lavishly illustrated with photographs and maps, the book offers beauty both grand and intimate — even the lichen snails and toads get their due. But the book is so much more than eye candy. Deeply felt, richly reported, “Caribou Rainforest” demands our reckoning with truths both beautiful and hard. Moskowitz is scheduled to present a slideshow and reading in the Mountaineers BeWild Speaker Series on Tuesday, Feb. 12, at 7 p.m. at the Seattle Mountaineers, 7700 Sandpoint Way N.E., Seattle. Moskowitz is also scheduled to speak, show slides and sell and sign books on Wednesday, Feb. 13, from 7 to 9 p.m. at the Northlake Unitarian Universalist Church, 308 Fourth Ave. S., Kirkland.